Also serving communities of Hoisington, Holyrood, Pratt. The average cost of assisted living in Great Bend is $4,445 per month. This is higher than the national median of $3,345. To help you with your search, browse the 2 reviews below for assisted living facilities in Great Bend. On average, consumers rate assisted living in Great Bend 3.0 out of 5 stars. Caring.com has helped thousands of families find high-quality senior care. To speak with one of our Family Advisors about assisted living options and costs in Great Bend, call (855) 863-8283. Great Bend takes its name from its location on the banks of the Arkansas River where the waterway turns or "bends" eastward. Known for its friendly, small-town atmosphere, Great Bend is home to about 15,000 people, including around 2,300 seniors aged 65 or older. For many seniors, the decision to move into an assisted living facility isn't simple. To help make the transition easier, Great Bend's two assisted living communities welcome new residents with social activities and all the comforts of home. In Great Bend and throughout Kansas, these communities may be licensed by the Secretary of Aging and Disability Services as Assisted Living Facilities, Residential Health Care Facilities or Adult Care Homes. The Great Bend area is home to world-class medical facilities, including Great Bend Regional Hospital and the St. Rose Health Center, in the event of medical emergencies or illness. Great Bend has an array of community resources for seniors, including the Southwest Kansas Area Agency on Aging, an organization that offers services to promote seniors' well-being, as well as one senior center. Assisted living communities in Great Bend are conveniently close to restaurants, parks, shopping centers and such attractions as Heartland Farm and the Barton County Historical Society Museum and Village, ensuring that every day is full of possibilities for seniors. Great Bend is more affordable than the average American city, which may leave more room in a senior's budget for assisted living. Overall, Great Bend's living costs are 12.7 percent and 22.7 percent cheaper than Kansas State and national averages, respectively. Great Bend offers two public transportation options, called C.A.B. and Mini-Bus. C.A.B. serves the city and certain outlying areas, while Mini-Bus operates only within the city limits. To arrange Mini-Bus service, seniors must call at least 24 hours ahead. A city's climate can be an important factor, especially for active seniors who enjoy the outdoors. Weather in Great Bend tends to be clear and dry, with hot summers and cold winters. In a typical year, the city averages 237 days of sunshine and only 27 inches of rain, with summer highs in the 90s and winter lows in the 20s. Assisted Living costs in Great Bend start around $4,445 per month on average, while the nationwide average cost of assisted living is $4,000 per month, according to the latest figures from Genworth’s Cost of Care Survey. It’s important to note that assisted living rates in Great Bend and the surrounding suburbs can vary widely based on factors such as location, the level of care needed, apartment size and the types of amenities offered at each community. 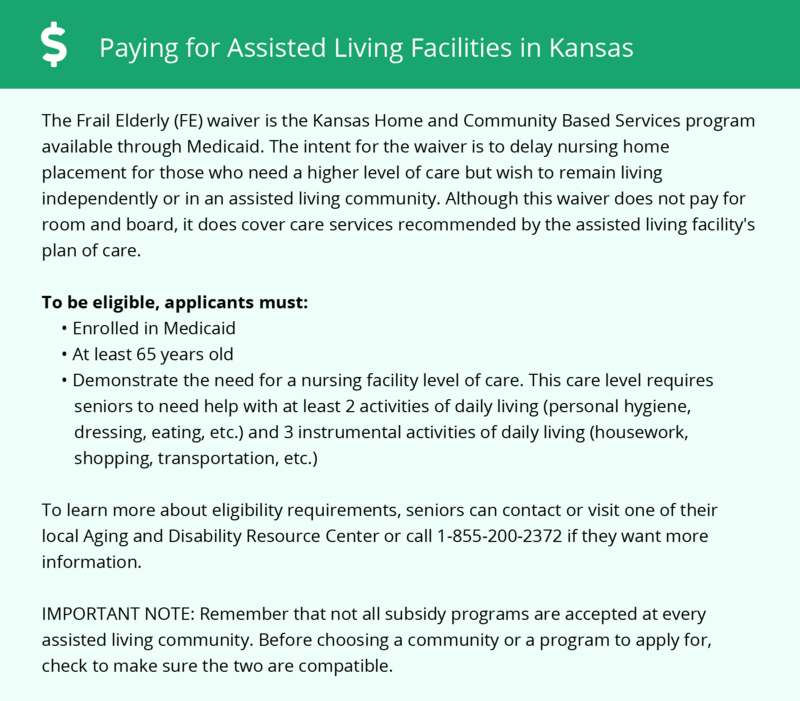 KanCare offers a waiver for eligible seniors, called the Frail Elderly Waiver Program, which pays for personal care services in an assisted living facility. 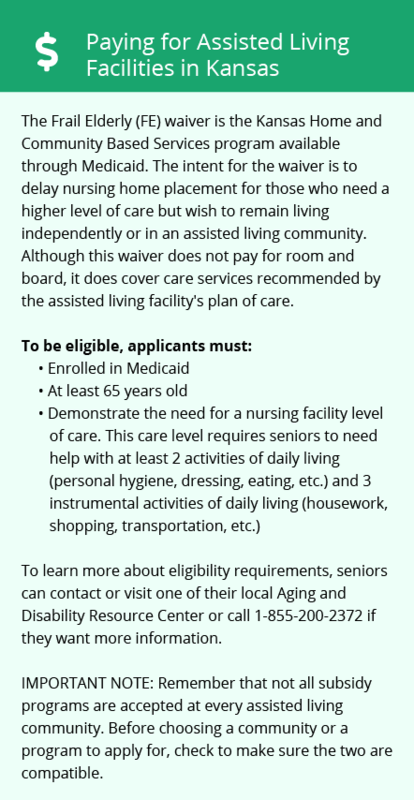 Families of seniors receiving the waiver can supplement services that the waiver does not cover, such as room and board. Great Bend and the surrounding area are home to numerous government agencies and non-profit organizations offering help for seniors searching for or currently residing in an assisted living community. These organizations can also provide assistance in a number of other eldercare services such as geriatric care management, elder law advice, estate planning, finding home care and health and wellness programs. To see a list of free assisted living resources in Great Bend, please visit our Assisted Living in Kansas page. Great Bend-area assisted living communities must adhere to the comprehensive set of state laws and regulations that all assisted living communities in Kansas are required to follow. Visit our Assisted Living in Kansas page for more information about these laws.